Electronic Waste Management and Treatment Technology applies the latest research for designing waste treatment and disposal strategies. Written for researchers who are exploring this emerging topic, the book begins with a short, but rigorous, discussion of electric waste management that outlines common hazardous materials. such as mercury, lead, silver and flame-retardants. The book also discusses the fate of metals contained in waste electrical and electronic equipment in municipal waste treatment. Materials and methods for the remediation, recycling and treatment of plastic waste collected from waste electrical and electronic equipment (WEEE) are also covered. 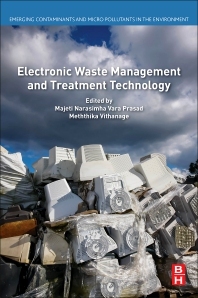 Finally, the book covers the depollution benchmarks for capacitors, batteries and printed circuit boards from waste electrical and electronic equipment (WEEE) and the recovery of waste printed circuit boards through pyrometallurgy. M.N.V. Prasad is an Emeritus Professor in the Department of Plant Sciences at the University of Hyderabad. He has served the Ministry of Environment, Forests and Climate Change, Government of India in various advisory committees on biodiversity conservation, ecosystem services, pollution control and abatement, environmental information systems and bioremediation of contaminated sites. He is an active visiting scientist in several international universities. He is the editor, co-editor, or author of 15 books and 95 journal articles (with over 6277 journal citations and h-index 41 as per google scholar). He has made outstanding contributions to the fields of Bioremediation, Bioresources, Biomass energy sources, bioeconomy and to the broad field of environmental biotechnology (including value chain and value addition products from plants used in phytoremediation) and bioremediation are his main areas of expertise. Dr. Vithanage’s research approach builds on enabling measurements of concentrations and reaction rates in environmental samples for key/emerging pollutants in the environment in order to assess their fate and transport to discover solutions to remediate those using different geo/bio/nano materials.